The planet's two largest ice sheets – in Greenland and Antarctica – are now being depleted at an astonishing rate of 120 cubic miles each year. 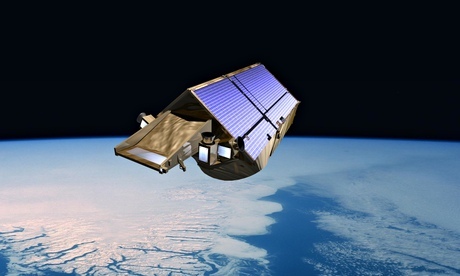 That is the discovery made by scientists using data from CryoSat-2, the European probe that has been measuring the thickness of Earth's ice sheets and glaciers since it was launched by the European Space Agency in 2010. The researchers, based at Germany's Alfred Wegener Institute Helmholtz Centre for Polar and Marine Research – used 200 million data points across Antarctica and 14.3 million across Greenland, all collected by CryoSat, to study how the ice sheets there had changed over the past three years. The satellite carries a high-precision altimeter, which sends out short radar pulses that bounce off the ice surface and then back to the satellite. By measuring the time this takes, the height of the ice beneath the spacecraft can be calculated. It was found from the average drops in elevation that were detected by CryoSat that Greenland alone is losing about 90 cubic miles a year, while in Antarctica the annual volume loss is about 30 cubic miles. These rates of loss – described as "incredible" by one researcher – are the highest observed since altimetry satellite records began about 20 years ago, and they mean that the ice sheets' annual contribution to sea-level rise has doubled since 2009, say the researchers whose work was published in the journal Cryosphere last week. "We have found that, since 2009, the volume loss in Greenland has increased by a factor of about two, and the West Antarctic ice sheet by a factor of three," said glaciologist Angelika Humbert, one of the study's authors. "Both the West Antarctic ice sheet and the Antarctic peninsula, in the far west, are rapidly losing volume. By contrast, East Antarctica is gaining volume, though at a moderate rate that doesn't compensate for the losses on the other side of the continent." The discovery of these losses of ice is particularly striking and represents yet another blow to claims by some climate-change deniers, who argue that the rapid loss of ice in the Arctic currently being observed is being matched by a corresponding increase in Antarctica. CryoSat's measurements show that Antarctica – although considerably colder than the Arctic because of its much higher average elevation – is not gaining ice at all. Indeed, it is – overall – losing considerable volumes, and in the case of West Antarctica is doing so at an alarming rate. This point was stressed by Mark Drinkwater, the European Space Agency's CryoSat mission scientist. "These results offer a critical new perspective on the recent impact of climate change on large ice sheets. This is particularly evident in parts of the Antarctic peninsula, where some of the more remarkable features add testimony on the impact of sustained peninsula warming at rates several times the global average."